The standard 2016 shelfwide cruise was cancelled because of mechanical failure of the NOAA Nancy Foster. However, there were there were several opportunities during the summer to collect data in the area of hypoxia and piece together a picture of the years hypoxic extent. Due to significant events related to a coral die-off at the Flower Gardens Banks off the Texas/Louisiana Border, NOAA’s National Center for Coastal Ocean Studies funded activities in 2016 to supplement available information. Transects C and F from the series of typical shelfwide stations were part of a cruise during 22-23 August for comparison with long-term data. Bottom-water continuous oxygen data were collected from July through October. A glider was deployed in the area between Galveston Texas and the Flower Garden Banks (Texas A&M University). The efforts of two 3-D dynamic physical models coupled with biogeochemical components were engaged to predict what the 2016 shelfwide hypoxic area might have looked like. The SEAMAP summer groundfish survey mapped oxygen conditions from the Rio Grande river to the Mississippi River delta between June 7 and July 19. 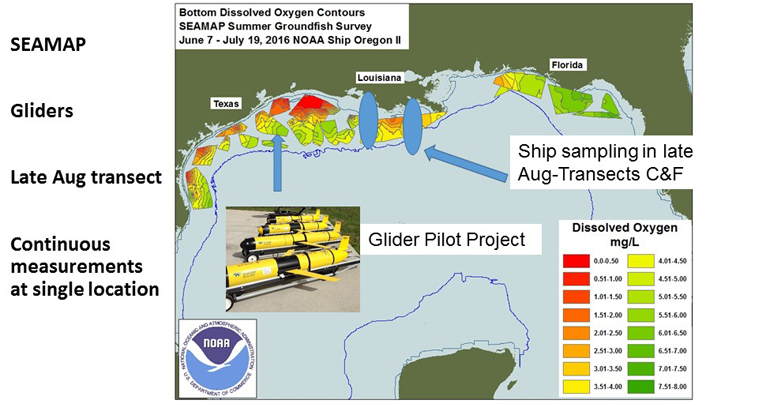 There were areas of low oxygen in nearshore waters along the Texas coastline and a large area of low oxygen off southeast Louisiana. The final dissolved oxygen data will be corrected, as necessary, from linear regression with the Winkler titrations over a range of 0.22 to 8.43 mg/L. Initial observations indicate correction, but the f-factor for the Winkler standard remains to be verified. Any corrected data will be reflected in other derived measurements. Salinity data not yet verified with PortaSal samples. CTD data remain to be post-processed with ALIGN CTD to be applied. Instrumentation was calibrated pre- and post-cruise according to manufacturer's specifications and standard method procedures were applied for several variables, not yet calculated, according to several LUMCON EPA-approved Quality Assurance Project Plans. Data collected as part of process studies remain to be analyzed and synthesized. Final QA/QC'd data will be submitted to NOAA NODC within two years of collection.